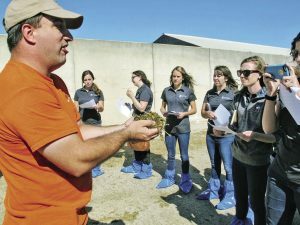 John Mitchell shows the group of dietitian students a sample of the alfalfa haylage that is part of the ration fed the dairy cows on the Winnebago County farm. The dairyman provided a tour of the operation that currently milks 375 cows three times a day and answered questions from the students on a variety of dairy-related topics. Read the AgriNews article here.